The Illinois State Police have revoked the appointment of a Muslim cleric to become a chaplain with the agency after learning about his documented ties to terrorist financiers. In January, the Investigative Project on Terrorism (IPT) reported that Kifah Mustapha had completed a training program and was poised to become the agency's first certified Muslim chaplain. The story pointed to court records in which Mustapha acknowledged working as a fundraiser for the Holy Land Foundation for Relief and Development, which was shut down by the U.S. government in 2001 due to its connections to the Hamas terrorist group. Mustapha was included on a list of unindicted co-conspirators during the Holy Land Foundation's subsequent prosecution for providing material support to terrorists. The case ended in November 2008 with convictions on 108 counts. Mustapha was listed among members of the Muslim Brotherhood's Palestine Committee. Prosecutors described the Brotherhood as "an international Islamic fundamentalist organization" that is "committed to the globalization of Islam through social engineering and violent jihad." Internal records entered into evidence in the case showed that the Palestine Committee was created to support Hamas "with what it needs of media, money, men and all of that." Mustapha not only was a fundraiser for HLF, he was on their payroll. In testimony, FBI case agent Lara Burns said Mustapha sang in a band that performed at fundraisers. 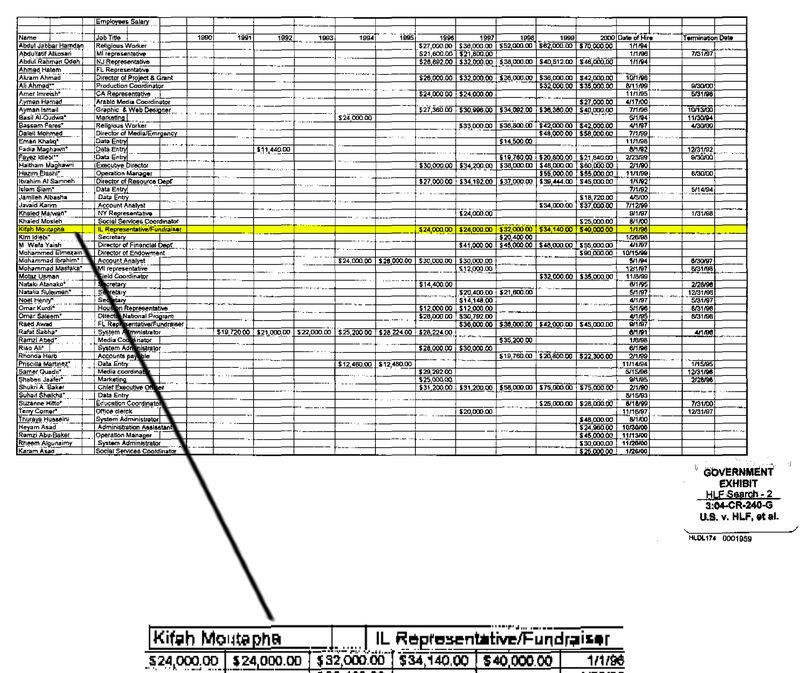 She pointed to internal HLF records to confirm Mustapha was a paid employee from 1996 through 2000. In addition to persuading 12 jurors, the evidence convinced the presiding judge of the defendants' guilt. "The purpose of creating the Holy Land Foundation was as a fundraising arm for Hamas," Judge Jorge Solis said just before sentencing the defendants a year ago. Mustapha was not charged with a crime. 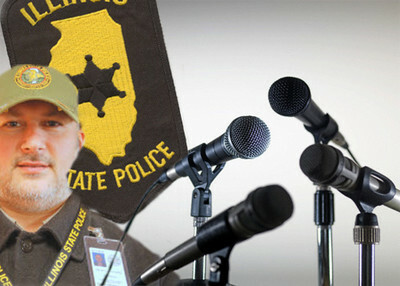 In March, however, the Illinois State Police acknowledged that they were reviewing Mustapha's appointment. On Friday, officials told him he would not be accepted into the program. During a news conference in Chicago Wednesday, the Council on American-Islamic Relations (CAIR) announced that it would help Mustapha file a discrimination complaint against the state police. It will allege that he was treated differently from chaplains of other faiths, said Christina Abraham, CAIR-Chicago's civil rights director. She called the IPT report the "defamatory rantings of bigoted individuals." Other Mustapha allies joined Abraham in calling the IPT and Executive Director Steven Emerson names. CAIR-Chicago Executive Director Ahmed Rehab called Emerson an "Islamophobe" and dismissed the IPT report, which was based on court documents and Mustapha's own statements, as nothing more than "half-baked, anti-Muslim propaganda." No speaker pointed to anything in the report that they believe is inaccurate. But they dismissed the report as a McCarthyite smear depriving Mustapha of his constitutional rights. Rehab, with no apparent grasp of irony, then called Emerson an Israeli lobbyist suspected of being tied to the Israeli Mossad. There is no truth to CAIR's claims and Rehab offered nothing to substantiate them. Like Mustapha, CAIR was listed as an unindicted co-conspirator in the Holy Land prosecution as a member of the Palestine Committee. Its attempts to be cleared of that label were rejected last summer. In addition, the Department of Justice and the FBI have stood by their conclusions about CAIR's ties to the Hamas-support network. Mustapha has helped raise money for CAIR, too. In his deposition, he acknowledged volunteering for the Islamic Association for Palestine (IAP), also listed in internal records as a component in the Palestine Committee's Hamas-support network. Mustapha described himself as a former member of a volunteer committee for the IAP beginning in the early 1990s. As a volunteer, he "distributed flyers" and helped prepare for "festivals or conventions." Those meetings often featured incendiary rhetoric and skits portraying Hamas violence against Israelis. Additionally Mustapha said that he donated money to HLF and "maybe" IAP. CAIR dismisses these facts as meaningless. Instead, it falls back on familiar practice and throws baseless accusations at its critics. The Illinois State Police made its own decision on Mustapha. The IPT merely highlighted information that he and CAIR would prefer be kept quiet. If the Holy Land Foundation for Relief and Development, was shut down by the U.S. government in 2001 due to its connections to the Hamas terrorist group, and the case ended in November 2008 with convictions on 108 counts, why has it taken so long to rescind the chaplain offer?